It’s winter solstice and the streets are wearing their first snowy covering of the year! A little bit of wintery magic! Are you still searching to find something for the public space aficionado in your life? We first ran a version of our “Gift Ideas” post in 2012 and it proved to be one of our most popular articles ever. This year’s updated list should also have something to help you out. It is designed with the last-minute shopper in mind. Some of these items are straight-up “things” you can buy. Others are the sort of experiential gifts that work best tucked inside a card. Many are just a couple of clicks away. All are fun times! ps. The nice image above is of Granville Street, looking south from Pender Street, circa 1936. (1) A copy of one (or more) of books on Vancouver – by local authors. A number of works dealing with city-building, architecture and urban issues have been published in the past couple of years. There’s also a fine selection of literary efforts by this years nominees for the City of Vancouver Book Award - including Carleigh Baker’s winning effort Bad Endings, Sam Wiebe’s Invisible Dead, Gabrielle Prendergast’s Pandas on the Eastside. Our current favourite of the collection? Susan Point: Spindle Whorl, the collective work of Grant Arnold, Ian M. Thom, Kathryn Bunn-Marcuse, Thomas Cannell, Myrtle Mckay, and William (Bill) McLennan. You can see the other winners – as well as previous finalists – here. In addition, here are some of our other new (and old) favourites. Vancouver Confidential - John Belshaw describes this new book as “a collaboration of artists and writers who plumb the shadows of civic memory looking for the stories that don’t fit into mainstream narratives.” VPSN collaborators Jason Vanderhill and Lani Russwurm are among the featured authors. Available in bookstores around town. Vancouver Light: Visions Of A City. A stunning collection of photographs of our favourite city, by David Nunuk. You can find all of these texts in stores like Pulp Fiction Books, the People’s Co-op Bookstore, Book Warehouse, and Indigo. Best to call/email first to make sure that they have it in stock. (2) Go weekly or seasonally with some urbanist subscription action. Like reading about urban issues? Hindsight is a brand new publication that looks at the “urban spaces that shape our lives” Forefront is a weekly long-form essay that covers city-building activities from around the globe. It’s the product of Next City, a superb blog. You can obtain a subscription here. 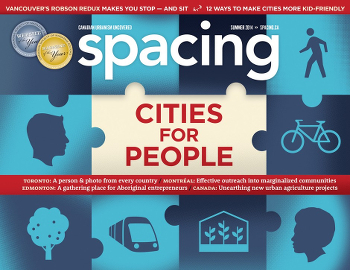 And of course, there’s also our good friends at Spacing, who produce a magazine (and several blogs) that “uncover the joys, obstacles and politics of Canada’s big cities by cutting through the cynicism that often pervades any discussion about urban issues.” Pretty good, eh? Their national issues come out a few times a year and are a superb read. Order them here. Hive Printing – A local firm that specializes in stylish tees, totes and accoutrements adorned with bikes, birds and historical city scenes. This is urban-loving fashion at its best. The Hive crew can be found at markets and festivals around the city. To find out where they’ve set up shop, visit their Facebook page. Ole Originals – We love the retro feel of these tee-shirts. Where Hive gets literal with their use of archival maps, Ole Originals re-invents an iconography that at once feels fresh and nostalgic. Check out their clever re-branding city and province. You can find their work in a variety of shops around the city. Locomotive Clothing – Prints a variety of quirky images, including some sweet tees with maps of the city’s bike routes. Locomotive sells online, and at various markets around the city. Check out their website for details. Searching for more inspiration? The ever-fashionable Miss604 has a whole page links to Vancouver tees. Be sure to check out her page for more ideas. While you’re at it, you can also check out her page of map-themed gifts, such as the excellent map art of Point Two Maps. (4) Wear your city, pt 2: Vancouver accessories! The city-as-icon theme continues. 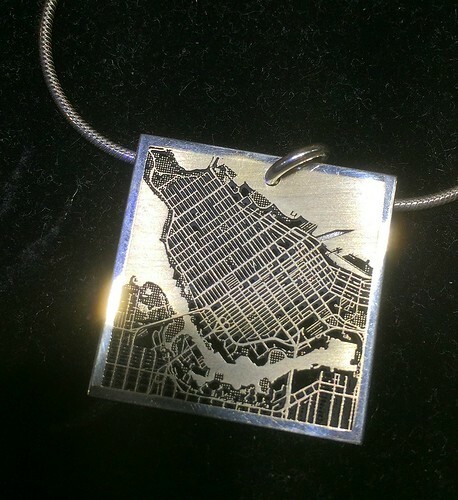 Lots of local artists are incorporating aspects of the city’s landscape into jewellery and other accoutrements. The laser cut necklaces shown above are by Branislav Gajic at Amity Design Studio. June Hunter turns familiar images – the Woodwards “W”, the East Vancouver cross – into earrings (available via Etsy, or at the Vancouver Art Gallery gift shop), and there’s no shortage of other pieces to be found at places like Granville Island or Blim Market. (5) Give the gift of edumacation. Vancouver’s Community Centres and public schools offer a dizzying array of classes – everything from sports to singing, music lessons to language studies, fine arts to business, crafts to computers. Classes vary in length, location, and cost, but it’ll only take a quick search online to see what’s available in your neighbourhood. Information on the city’s 24 community centres can be found here or you can zip over to the Vancouver School Board website to see what’s on offer there. Why not double-up the fun? Don’t just sign your loved one up for lessons… join them for the learning as well! (6) Add a splash of colour to someones wall with some locally-themed art. 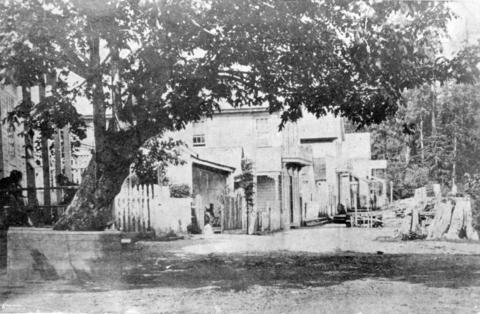 You can find lots of images of the city and its neighbourhoods. Some of our favourites come courtesy of local artists and print-makers like Anja Jane, Tony Max, Gary Nay, and others. (10) Historical pictures. Who doesn’t like to see the way we used to live in years past? The Vancouver Public Library has a great selection of old maps and photographs of Vancouver – which can be purchased for reasonable cost on Floor 7 of VPL Central. Or, you can go the DIY route and visit the Vancouver Archives on-line catalogue – where they have an amazing assortment of high-resolution photographs that you can download for free. Having the VPL and Archives print your pictures for you may mean a bit of a delay — but not to worry, many of their collections are available on-line and in high-resolution. You can print ‘em yourself via your local photo shop. (12) The Gift of Culture: Museum of Vancouver, Van Art Gallery, and more. Grant your friends year-round access to one or both of the finest cultural venues in the city. The Museum is currently featuring the excellent City on the Edge: A Century of Vancouver Activism. MOV Memberships come in a variety of flavours, and grant you year-round access. (The dual pass is a great deal for two adults). Check out related pages for the Vancouver Art Gallery, the Vancouver Maritime Museum, and UBC’s Museum of Anthropology. (13) Show your love of public transit. Translink has an assortment of great merchandise available, including shirts, water bottles, scale models, shower curtains, and some very comfy throw pillows. You can find out more via the Translink Store. (14) Go green with local nature. For over two decades the Stanley Park Ecology Society has played a leadership role in the stewardship of Stanley Park. They do this through a range of education, research and conservation programs. You can support the good work they do by taking out a membership with their organization, “adopting” a bird’s nest, paying to plant saplings or several other things. (15) More brightening, less frightening – Bike & Ped lights. There are too many people out there still walking and biking around without decent lights or reflective gear (Velcro bracelets, vests, etc.). Why not keep your loved ones safe by upping their visibility. MEC is an obvious go-to (and their new USB plug-in lights are awesome!) but there are lots of other places to get this sort of gear. (16) Plan a walking tour. Why wait until May for Jane’s Walk? Plot out a stroll and show your friends and family some of your favourite spots – the architecture you like, your favourite pieces of public art, a hidden park, other good places to meander. Show them why you like the city. Want to amp it up a bit? Put a few more treats into the itinerary – like a stop at your favourite café or restaurant for hot chocolate, or an end-of-walk admission ticket to the VAG or Science World. Vancouver Heritage Foundation – Conducts popular summertime walks, each for $15. You can get a sense of their schedule here. John Atkin – A popular civic historian and author who conducts walks year round. Prices vary. Be forewarned: Atkin’s knowledge of the city is encyclopedic! Forbidden Vancouver – hosts a series of regular walking tours (and photo walks) in downtown Vancouver. Titles include: Lost Souls of Gastown and Prohibition City. A lively mix of history and theatre. (17) Make a gift box on behalf of a friend or family member. The holiday season is festive and fun for many of us. For those less fortunate, the seasonal festivities can also be a time of loneliness and challenge – a time that is further compromised by the city’s cold, wet and rainy weather. There are lots of organizations around town – Lookout, the Covenant House, the Downtown Eastside Women’s Centre, Carnegie, the Union Gospel Mission, the Kettle Friendship Society (to name just a few) – who will take donations of money, food, warm clothing (socks, sweaters, long johns, rainwear), toiletries, and other un-wrapped gifts. (18) Surprise your loved ones with some random market magic. Still searching for some stocking-stuffers? You’ve just scored yourself a great opportunity to support Vancouver’s market scene. The annual Christmas Market occupies Queen Elizabeth Theatre Plaza between now and December 24. For the foodie on your list, there’s the weekly Winter Farmers Market at Nat Bailey Stadium – every Saturday from 10am-2pm). And if you want to go all-in, wander over to Granville Island for any number of specialty gifts. (20) Do a little digging, tell a story. Research a home or building. For those who have time for a quick trip to the archives: put your investigative talents to good use by researching the history of a favourite building. A couple of hours of time, and you can gather all sorts of neat stuff facts via fire insurance maps, building permits, city directories and more. Snag a few historical photos, take a print of the architect’s drawings, write up your notes, and voila – a narrative of that special place.